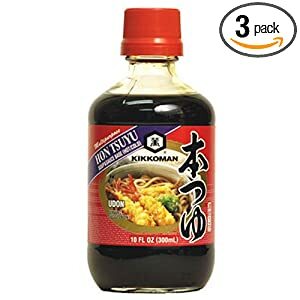 I came across this udon soup base the last time I was at the grocery store it looked quite interesting to say the least. The prospect of just making udon noodles and having a sauce already to go for it was great. So I dropped it in the basket and onward I went thinking now what do I put with it? Well that came in the form of a traditional Japanese udon soup stock using vegetables and a few spices to make it. I started by dicing up some scallions, celery, and a tiny bit of ginger to spice it up just enough to make it interesting. Next while the udon noodles were cooking I poured some of the Udon soup base into a large bowl and mixed in the vegetables to let them marinate for a few minutes. When the noodles were done I drained off 1/2 of the water and put the rest with the noodles into the bowl with the udon soup base and vegetables hit it with a quick shake of salt & pepper there it was. The rich flavor of the udon soup base mixed well with the fresh vegetables and the hint of ginger was great. Spicy enough for my roommate who has to have it burning his lips off while still having flavor. This combination of udon noodles and soup base is really easy for people who do not really have the time to cook dinner. Just drop the udon noodles into the pot, mix up a little Udon soup stock from the base and bingo there you have it.